On the heels of the 2008 Tony Awards, I bring you a review of a play devoid of pop composers, celebrity casting and green monsters. 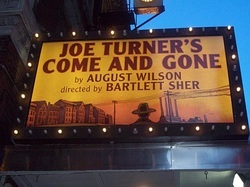 I saw August Wilson’s Joe Turner’s Come and Gone this weekend (missing the President and Mrs. Obama by a scant week) at the Belasco Theatre. This Lincoln Center Theatre production (no doubt at the Belasco due to Lincoln Center construction) has created much buzz surrounding its direction. Bartlett Sher (South Pacific, Light in the Piazza) was given permission by Mr. Wilson’s widow to direct Joe Turner. Much has been made of Mr. Wilson’s outspokenness and wishes regarding African American directors working on African American plays, and the hiring of the non-African American Mr. Sher. While I cannot speak to the back story of this brouhaha or the motivation of the widow Turner, I can attest to the fact that this was not a gimmick. Mr. Sher does a lush and lovely job with this great American play. There is musical theatre in Mr. Sher’s bones and it shows. The direction is fluid and musical and modulates in tempo, resulting in three hours that actually flies by. The play is set in 1911 Pittsburgh (the second part of the Wilson Pittsburgh trilogy) in a boarding house. The boarders all present tales of searching and yearning for people and love in various forms. The most permanent boarder is Bynum (Roger Robisnon; TONY,) a mystic of sorts. The (white) traveling salesman Rutherford Selig (Arliss Howard,) creates a rich political and social context. While the individual tales are compelling and dramatically poignant, the real story is post slavery society. Each of the charactersrepresents different stages of acclimation, not unlike non-slaved but subjugated immigrant populations. The owner of the house, Seth Holly (Ernie Husdon,) represents the consummate free man. He has no truck with African customs or mysticism. He owns his own business and has plans to develop a second business that will train and employ other men of color. His wife Bertha (Latanya Richardson Jackson,) except for her salt throwing habit, has embraced the life of the northern experience as well. One boarder, Jeremy, represents the other end of the freedom spectrum. His relationship with his work and his personal life has all the earmarks of a man who does not own his destiny. All of the other characters fall within these opposites. The cast is flawless, except from an awkward child actor, attesting to the rarity of lack of self-consciousness in pre-pubescent boys. Ernie Hudson (OZ) is mesmerizing. He is a powerful and large actor that does not shy from nuance. Ms. Jackson is a perfect match to Mr. Hudson, and provides a wonderful softness to the tale. It is however, Mr. Robinson that steals this show. His body and cadence curl into a Yoda/Professor Marvel creation. His creation of Bynum is so three dimensional I wanted to have lunch with Bynum. Like most great American plays, the characters and their stories linger and tell a tale that resonates for all. With absolutely no disrespect intended, Joe Turner’s Come And Gone, is a story that transcends one group of people. The very end of the play might be considered trite and sentimental by some. Color me a reformed cynic; I loved it. You will be very happy having seen this beautiful production.